Watch your prepared cakes and pies soar out the door with this cake / bakery box! This bakery box is also a great way to offer your smaller baked goods, like cookies and muffins, by the dozen for higher volume sales. The bakery box comes as a flat sheet for convenient storage, and assembles easily by folding and locking tabs together at the sides. A white exterior with natural brown interior and durable paperboard construction provides the perfect palette for your patrons to pick up some delicious baked goods to go. I really loved this boxes, as described, really good material (thick and sturdy), definitely buying again. Delivery was really fast, I'm very satisfied and I do recommend them to anyone. These boxes are great! I use the 12" as a standard in my shop instead of carrying various sizes of boxes. If the cake is too tall, I just tape the sides of the lid down to the sides so the lid is standing up or angled over the top of the cake then cover the front with plastic. Works great! These in my bakery are used for 10 inch cakes with a 12 inch drum. You can also use a 12 inch drum and a 8 inch cake and they fit very well. Always remember durability is everything and I will say these passed the test. I bought these when I first opened my business. They are good quality and worked give but are very heavy so shipping costs are expensive. If shipping costs are not an issue they are good price. These are great cake boxes. I know a lot of people like the pink boxes but I like the white boxes more. They're fairly sturdy and a good value for the price. while the white boxes are nice and professional looking, they are made out of a thinner material that I would like. Also the grease proof material still allows grease spots. We use these cake boxes daily and they have been great. They're durable enough to hold our cakes and cupcakes. They are also one of the lowest prices we have found! This is a great box. Quick and easy to put together, sturdy, and we are able to tape the sides. It is a little shorter than other boxes but we use it for cheesecakes. Decided to buy this bundle after I bought the 10 pack because it just simply made my life easier and for the cost it did its job at holding not only my cakes but also my cookies when I receive bulk orders. Beautiful cake boxes. We were looking for a simple, high end look and this box fits the bill. There is nothing like a classic white box. These boxes can be put together quick and easy; we use them for our birthday cake and they work great. We will buy the full case next time. I've order several different-sized baking boxes from here! Best quality I've found at an unbeatable price. Boxes are well made and thus very sturdy! Boxes are exact on their size and dimensions. I use these to package my 9inch round cakes that are usually 4 inch high. Buying them in bulk makes them way cheaper in the long run. In the past i used those noisy plastic containers but you run the chance of damaging your cake and even the container when you have to open it. This is a better option in my opinion. I am pleased. The cake box is perfect for my ten inch two layer cakes. Also great for orders of two dozen traditional size cupcakes or four dozen mini cupcakes. Good quality boxes that are easy to assemble. Great presentation, sturdy, and true to size. Fits the 12" cake drums that were also purchased on this site perfectly. I have shopped around for a long time looking for the best quality boxes and best in price of course. Let me tell you WebstaurantStore out did them selfs. They put a lot of effort in ensuring they carry quality products. The box is not flimsy. It’s durable and looks professional. Gives nice presentation definitely worth the money. I will keep coming back to shop here. These boxes are perfectly fine for fitting my 10" cakes in. My only wish is that these came in kraft brown instead of white, to match the rest of my boxes. 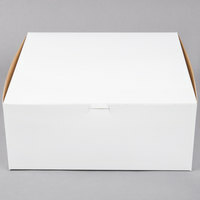 These boxes are perfect for cakes that have a lot of decorations and require more height than the average 4" cake box. These are my go to boxes for all my cakes. It’s great color, great size, great material an my cakes fits perfectly from side to side it’s great I love it ! ! ! ! I do a lot of shipping out of state and these boxes are not only sturdy, but look good too. The are also very easy to build. Excellent quality, at a very good price, we use them for all our 9'' cakes, protects product well. The material is just the right thickness. This cake box has been used in my bakery for several years. It is quality, looks nice and simple to put together. Will order again! The cake boxes are the perfect box to add your own personal touch. They fold up within minutes with little effort and can comfortably hold cake boards up to 12 inches. I usually use these for my 10 inch cakes. These are good, sturdy cake boxes. It's nice that they come in packs of 100, makes storage easier. They assemble quickly, and easily. The only slight issue, is the tendency of the top side flaps to curl inside the box, we just tape the top flaps on the outside, no problem. These 12x12 cake boxes are great. They are very sturdy and are the standard cake box you would find at most stores but at a better price. Great size bakery box for when we have a take out order of 6 cinnamon rolls or other backed goods. Very clean look and we tape our menu on the top. These white cake boxes are perfect for my 12 inch cakes. I don't have to worry about my product falling out of the boxes because they very durable and sturdy. Perfect for any occasion! Very sturdy, I even use them for my 2 tier cakes as well. And i like the fact that gives the professional and elgant presentation. The boxes are easy to assemble. The hold the cakes perfectly. The price is very reasonable. Will definitely be reordering. I received the order in a timely manner. Love the height on these. They seem much more sturdy than the brown boxes and fit our cakes perfectly - the 4" tall ones always have to be tented. I absolutely love these boxes. They aren't flimsy and hold up really well! And they are the perfect height for most of my 3-4inch cakes with small cake toppers! We use these boxes for the majority of our cakes. They are nice and thick, and easy to fold. They're also the perfect height for a standard cake, without us worrying if the lid will hit the cake! I love these. They are sturdy and easy to put together. Will be ordering these everytime I need boxes for this size. Just what I needed! bought these specifically for double layer 10" square cakes and I was not disappointed at all. Cake fit perfectly into the box. Better than boxes I have bought from other companies. this cake box is strong and reliable, easy to use and fold and fits all my cakes perfectly, join two together to fit high cakes! Cake box was sturdy and did it's job. The way the outside edges sit do rub on the cake but I can just get bigger boxes. These boxes are durable and so easy to put together. Great for transporting those cakes safely. Nice height and if I need more I just tape the side of the lid to hold it in place. Will order again! I use a variety of this boxes in my shop. This size fits perfectly for a variety of products, from 10inch cakes to pastries, cupcakes and pies. The heigh is also an important detail. Great product! Perfect size for a dessert cake. I was pleasantly surprised how fast they arrived in the mail! I will be purchasing these again! 5 stars! This product 987 12" x 12" x 5" White Cake / Bakery Box - 100/Bundle totally value for money. Ive compared the price to different websites and i cant find any cheaper than this! I bought this item together with 11221 12" Corrugated Grease Proof White Cake Circle - 100/Case and i am happy with my purchase! Its sturdy and has exclusive finishing i totally love it! Came in perfect condition and are very well made. Very easy to fold and my cakes fit perfectly. Also use them for packaging my mini cheesecakes. These boxes are great for larger cakes. They are easy to assemble. The material they are made of is just thick enough to make them sturdy. The box top closure is a great balance between easy to close, and secure. Better than a lot of cake boxes that I've used in the past. These 12" boxes are great! The locking side have a really good hook that keep the sides together really great! The white is a good background color for your stickers. I will definitely buy these again! We use this boxes all the time, we like its high that fits our cake without damage them, we really like Webrestaurant fast shipping, thanks! Perfect box for a cake or a dozen cupcakes. It's very strong and easy to assemble. These are the only boxes I trust to carry the weight of a large order. Best used for cupcakes because it's a little to shallow for cakes. Holds at least a dozen standard size cupcakes. Works best with inserts. Nice square box. Bought these for a specific function in mind; these worked great! We will definitely use the leftover ones for storing our baked goods. We tape ours so they stay folded, but that's our personal preference (and we do so for all our our boxes). Boxes are what I expected to get. They come nicely packed and wrapped so the boxes wont get damaged during shipment. They are also very easy to put together! These boxes are very sturdy, and great for holding cakes. We keep these boxes in stock in every single size because we like them so much! I use a variety of boxes in my bakery. I tend to favor the pink boxes, but I can only find this essential size in white. This size fits my 10inch cakes perfectly. I really like the 5 inch height so I don't have to worry about the cakes not fitting. I feel like a pro when I put these boxes together, but it does require a touch of patience to make sure all the folds are smooth. A great box at a great price! I love their bakery boxes. I was worried because of their great price how the quality would be, well I was pleasantly surprised. I got other sizes and all of these boxes have exceeded my expectations. Great box! Use it for my cake orders or cupcake order. It fits about 15 - 18 cupcakes nicely. Will continue to purchase this box size. This is a great box! Very strong and sturdy at a very good price. I'm very impressed with the quality. I love the color, too. They add that professional look to anything I put in them. These boxes are very sturdy and can be put together in a flash. Keeps everything fresh and protected when traveling with a cake or even cake pops. These boxes are so easy to assemble. They are tall enough for most of my round 2 layer cakes. I even tape the edges to the side of the box and use them for small 2 tier cakes. These boxes are my go to for three layered cakes! They are very sturdy, easy to assemble and the price cannot be beat. Highly recommended. Our 10" cakes fit perfectly in them. Keeps them nicely snug so that they don't move around. We don't put the side flaps back in though so they don't touch the cakes. Great quality and almost 1/2 the cost from a local supplier. Will definitely re-purchase this product from here, it comes nicely wrapped and every package has been perfect. Love these boxes! They are my go to for any cake when I use a 12" cake board. Super roomy and perfect for all my baked goods! This is a great quality box. I use it for my 10" cakes on 12" rounds and prefer to turn them inside out to use the kraft, brown side. Good sturdy box which held up great for our six pound carrot cake! Have used these in the past and think they are much more sturdy then the window boxes. These are great sturdy boxes for my cakes. I slightly prefer the 6"deep box because the cake generally fits in and I am able to close the lid. Overall great box. These are great cake boxes. I always buy my boxes here because they are sturdy, well made and give my products the professional appearance they deserve, all at a economical price. Can't go wrong with basic cake boxes. Fits my 10" cakes with room to spare on the sides so cakes don't get squished. I like the 5" height as well for taller cakes or cakes with toppings, such as strawberries. Excellent boxes for a dozen cinnamon rolls, which can get very heavy. I like that I can crease all the corners of the flat box, slide my product onto the surface that will be the bottom of the box, then fold up the box around it. The lid folds into the box snugly, which is nice for keeping things from drying out inside. Excellent value of 100/bundle for this price. You can't find boxes priced that low anywhere else! I love the quality of these boxes. Sometimes buttercreme frosted and filled cakes can be really heavy and I don't have to worry about this box collapsing while the cake is being transported. This box fits a 9-10 inch cake nicely. It is less flimsy than the boxes I find at the craft store. I like the higher quality of this box! Love these boxes! Much cheaper than buying them at a craft store for the same quality. Two caveats - often my 10" cakes are a bit taller than 5", so I also purchased some 12"x12"x6" boxes (only available in a larger quantity). Also, I sometimes need to tape down the tabs to keep them from grazing the sides of my cake. These boxes are the perfect size for my 10" Birthday cakes. I put them on a 12" board and they go nicely snug into the box. They are easy to assemble and I like tat I can buy 10 at a time. Perfect size cake boxes and I also use them for decorated cookies. Hold up very well not flimsy at all. Will be ordering these again. !! These are great boxes! I have tried other boxes from other stores but I love these and they hold up 10x better than the others. These boxes are great. They are much sturdier than boxes you get from most bakery supply stores for twice the price. These are highly recommended! I have purchased these boxes locally and they weren't a heavy duty material. They work great with all cake sizes and are very durable. I order these monthly for my bakery!! Good quality boxes that are easy to put together. Perfect for transporting up to a 10" cake with room for the cake board. Travels well and holds a nice heavy cake. Top quality boxes. These boxes are very sturdy holding solid not flimsy. The boxes are very easy to put them together. Easy flat storage too. I do quite a bit of larger pastries breads, cookies etc. and this box has never let me down or been damaged with something heavy that i put in it. You'd think because it was larger and the material its made of it'd be flimsy. Not at all this holds up to a substantial amount of weight and they do not bend easily. Good quality, sturdy enough to transport cakes in - for the price it can't be beat. These are my GO TO cake boxes, putting them together is easy. They come flat. Most of my cakes are 4" tall, so I need something at least 5" in height. I use the greaseproof 12" round cake boards with these boxes and they fit perfectly. You have to be careful with the big flaps on the right and left of the lid part, as you're closing it the flaps can get caught on the cake. Just something to note. My go-to 12" box. They are super easy to fold up and stay together, unlike many bakery boxes that I have used in the past. These boxes are perfect for that classic bakery look for cakes. The only downside is that you have to put them together and sometimes the lid does not stay close. Nothing a small piece of tape can't fix. These boxes are great! they are very well made and keep the cake in place, I love them for stacking (Which I could do with boxes from the craft store) and as always the price is great! Excellent boxes! durable, sturdy , easy to assamble. Perfect for my catering business. My cakes look even more profesionals in the boxes. I bought 200! This bakery cake box is the perfect size to hold my square or round cakes. It easily holds up to a 12" cake single or double layer. Very sturdy. I am glad they have these boxes it is sometimes heard to fin 12x12x5" I have been buying else were. You have a better price for a small amount as well as larger . Great box that we use for 10 inch cakes. Sturdy enough to support the large cake and the tab In the front keeps the box closed. I love this box because it is strong and steady. It is perfect for cakes. I will recommend this box to other customers to order for their use. The cake boxes I order come are shipped well and don't have them tear like buying at a retail store local. Perfect for my needs and price great. These boxes are sturdy and well made. We are always happy to place an order because we know we are getting a quality product. Thanks! We use these boxes for most of our cake orders. Since we do a lot of tiered cakes, I find these are perfect for transporting those, too, by simply taping the sides of the box up or cutting the top off. This provides a great protection against damage. great boxes, easy to put together, i wish they came in more colors or maybe striped ,but other than that ther are great!! thanks webstaurantstore!!!! Bought a few packs of he 12" bakery boxes to test the cake round boards we purchased here, very impressed with the perfect fit and sturdiness. Bought these for small cakes and for cookies. The box is very sturdy and looks like it will hold pretty tall cakes. My only problem is I had to put a few pieces of tape so the side inserts wouldn't keep popping out. Otherwise these are good boxes. Nice sturdy cake box easy to assemble. We use these for our 10 inch cakes. Being 5 inches tall allows us to fully decorate before putting in the box. Great quality boxes. I ordered a few because I kept running into boxes that were not sturdy or tall enough for my strawberry short cake. My cake is heavy and has three layers. What a relief I finally found the perfect box! I originally purchased boxes at a party store before finding this website! Even with the shipping charges I am paying less than half and I always have them on hand for customer orders. They are strong and keep my cakes safe!! I absolutely love these Boxes!! these were perect too fit my cake pops and and my 10" round custom cakes!! Great Low price and very sturdy!! I bake from out ouf my house for a few people so I purchased boxes for the cake I make and these boxes are great they are easy to put together and are priced well. Nice and afforable cake boxes. I was really shocked that the cardbroad was so sturdy and tuff. Very pleased with my purchase and i plan to order more. This cake box is very versatile and also very durable. It can hold very heavy cakes, but also very light pastries. I use it for both. Boxes were as expected. No surprises. Shipped quickly and very reasonably priced. I will definitely be ordering many more of these. Much cheaper than buying them through our local bakery supply store. This is a good quality cake box that we use for transporting wedding cutting cakes. We don't sell cakes in these boxes because they don't have a window, but they work great for their purpose. I love these boxes! They can be used for anything! I've used them for layered cakes, and bundt cakes. They are inexpensive compared to the ones being sold in my local cake supply store. Looked everywhere for boxes this size at a reasonable rate. This price surpassed ALL others and it is perfect. Within a few days had my boxes with cakes in them ready to go. This order will last awhile and I highly recommend this box for baked goods. this is a great price and good functionality. it is not the sturdiest, but is essential to a professional kitchen. every professional kitchen i've been to has these kinds of pans. These bakery boxes are perfect for cakes 6" through 12" inches - I bought this bigger box to save on space and get more out of one product, instead of stocking many different sizes. Even my smaller cakes look great in this box! I used with the 12" corrugated cake rounds.